Gucci has extended the G-Frame watch collection with a new size and a variety of styles that combine the House’s design codes with contemporary detailing. Highlights include a range of versatile new sizes with interchangeable straps. Declined in two different finishes, the cases of these watches are enhanced by delicate snakeskin straps, offered in a range of additional colors to match the mother of pearl dials. 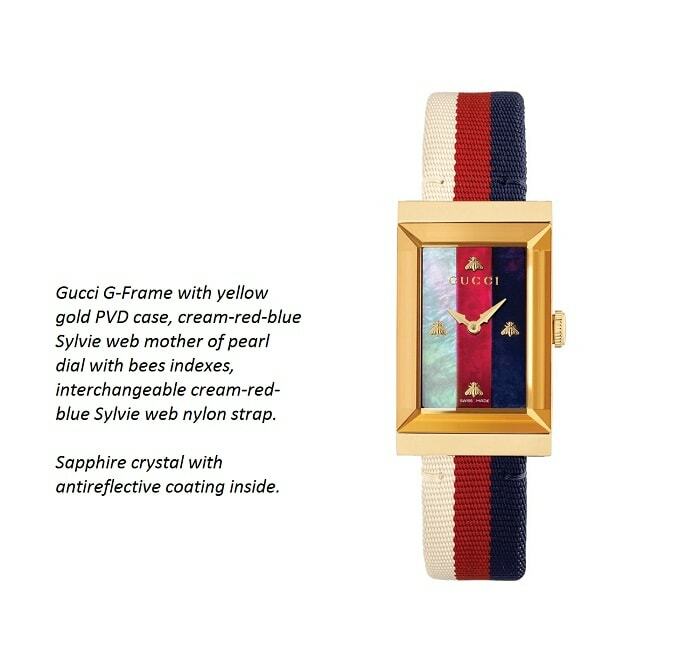 A yellow gold PVD variant with a cream-red-blue Sylvie House web mother of pearl dial, for example, comes with a textured brown snakeskin strap, which can be exchanged with a palette of alternative snakeskin straps in tones of white, red, or blue, each finished with a yellow gold PVD ardillon buckle. 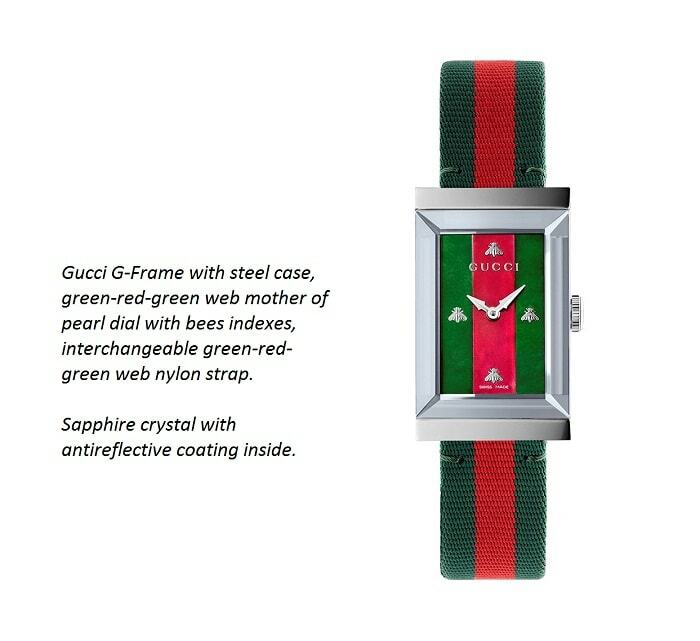 Also displaying House’s web pattern, another 21 x 34 mm model brings together a steel case with a green-red-green mother of pearl dial with signature Gucci bee indexes. The timepiece invites you to change the strap depending on your mood, with a choice of colored straps. In two other 21 x 34 mm editions, the web motif flows seamlessly from the dial to the strap for a continuous 360-degree look with a strong Gucci statement. Another special feature of these new Swiss Made timepieces is the pyramid shape of their sapphire crystal dials, which produces beautiful light effects. 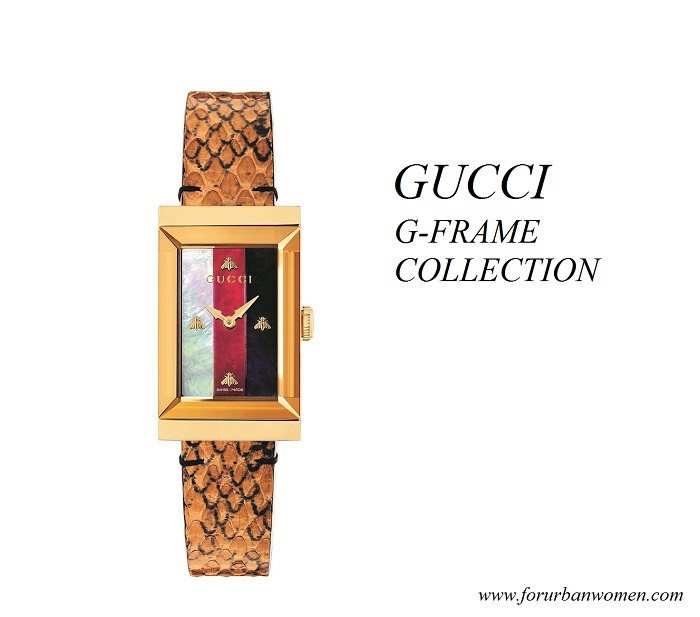 Colorful and elegant, the new G-Frame watches will add an eye-catching touch to any look and combine easily with other Gucci pieces. 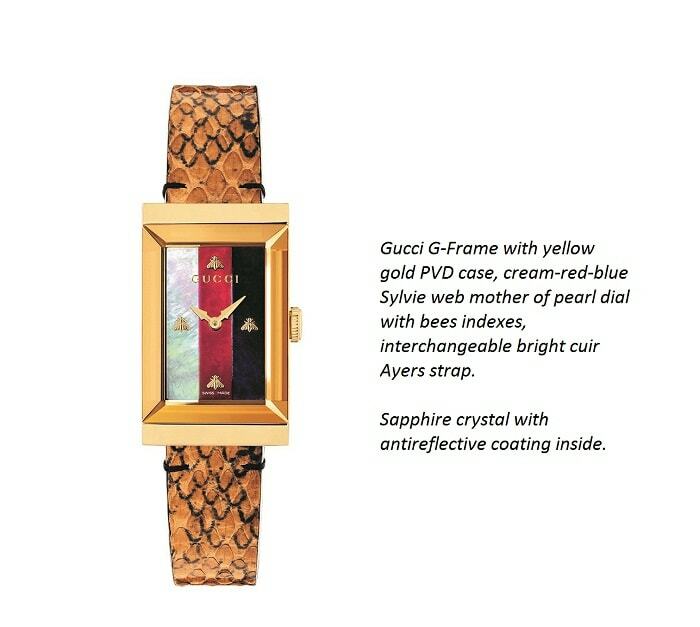 Gucci Timepieces, one of the most reliable and consistent fashion watch brands, with a clear design approach and positioning, has been designing, developing and manufacturing iconic Gucci watches since the early 1970s. Rigorously made in Switzerland, Gucci watches are recognized for their innovative and contemporary design, quality and craftsmanship and are distributed worldwide through the exclusive network of directly operated Gucci boutiques and selected watch distributors. 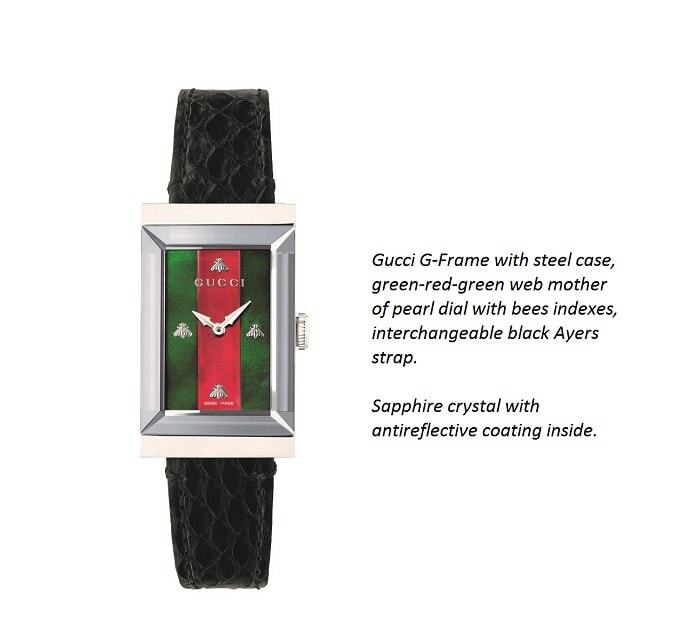 For more information about Gucci Timepieces, please visit www.gucci.com.